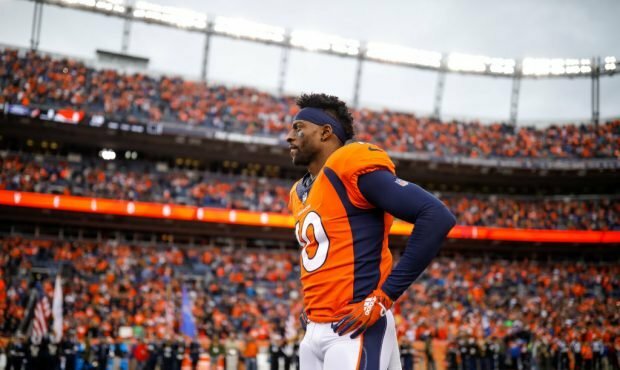 The list of ailing Denver Broncos grew by one more starter on Wednesday with Emmanuel Sanders going out for the year with a torn left Achilles. But despite the litany of injuries to the club as of late, there’s no time to be upset, said “Stokley and Zach” co-host Brandon Stokley. “Look, there’s no time for crying. There is no time to get upset. It is a tough blow, but it’s next man mentality. That’s your approach,” Stokley said. Stokley called Sanders season-ending injury a “huge loss” for the Broncos but said their next opponent, the San Francisco 49ers, aren’t going to “feel sorry” for the team. Stokley gave Broncos head coach Vance Joseph kudos on Wednesday for having the same mentality in his post-practice press conference. “We can’t cry about it. We have to move on and go play a football game on Sunday,” Joseph said. Quarterback Case Keenum said called Sanders’ injury “tough” as well but also said it’s “next man up,” saying it’s an opportunity for some of the young players in the room to get a shot. “I’m a product of somebody getting a chance with somebody getting injured. So, it could be a great start for somebody’s career, one of these young receivers who we trust,” Keenum said. Along with rookie Courtland Sutton, who’s seen time as a starter already following the Demaryius Thomas trade, Denver will now rely on what Joseph called a “young” but “proven room,” including rookie DaeSean Hamilton, Tim Patrick, and River Cracraft. The Broncos also claimed veteran wide receiver Andre Holmes off waivers from the Buffalo Bills.